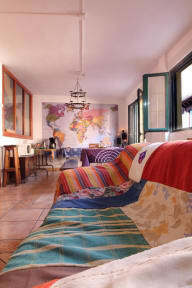 Duermevela Hostel has 7 rooms with a total of 20 spaces in bedrooms of 2 or 4 people. All rooms include linens and secure lockers. 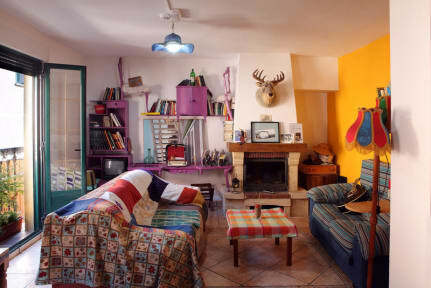 We also have a variety of common areas where you can meet other travellers, play guitar or just sit back and relax. There is a living room, a kitchen, an outdoor patio, a courtyard and a cinema room. Breakfast is made everyone morning with natural ingredients and coffee or tea for 1.5€. Also, we have a kitchen that is fully stocked with all you need to make your own meals. The reception will give you all the information you need to know the city and its surroundings, also let you know where you can see a great sunset, where to sit and read a good book and give you the insiders secrets on all the hot spots of the city. If you plan on checking in later than 8.00 pm, please email or give us a call my phone ahead of time!!! Method of Payment upon the arrival: Cash, Credit Card or Debit Card are all accepted.